What happens when you dump two expert anglers on unfamiliar water and tell them to conquer it … and each other? A Texas buddy of mine and I pulled up to a bar that started in 19 feet of water and topped out in 5. We were both fishing a Carolina rig, and both using a Berkley Chigger Craw for bait. So why did he catch five bass in the next 10 minutes while I remained skunked? It’s hard not to be fascinated with the factors that affect fishing success. And as much as one tries to break things down to key elements such as bait selection, speed, location, color, etc., the more frustrating it can be—the number of possible combinations is endless. 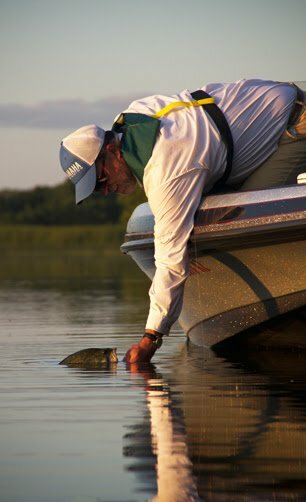 When we launched Lake Commandos our goal was simple: to highlight the thought processes successful anglers use when developing effective patterns. Each week my guest and I fish unfamiliar water. And before we even launch the boat, we each announce our chosen pattern for the day. Then we fish my guest’s pattern for two hours, then switch to my pattern for the next two; the most productive of the two are then used the rest of the day. Weird? Yes. Tough? Always! Effective? Most of the time. So why do it this way? Because when you are forced to fish a single pattern and trying to beat the guy with you, you do whatever it takes to catch fish. And that’s when you really start to push the envelope. 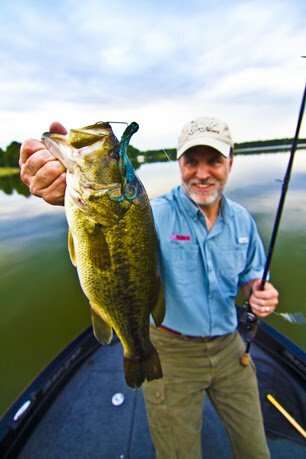 Ponder the following questions a moment: When’s the last time you burned a bass jig over shallow grass? Tossed a lipless crank in two feet of water? 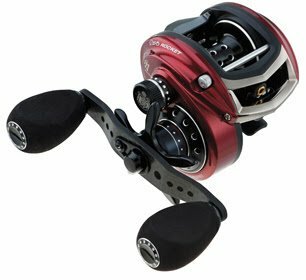 Compared your flippin’ efficiency with someone using a reel geared a speedy 7.9:1 (or even 9:1)? Made a color change simply because a cloud bank moved in? Tried fluorocarbon for vertical jigging in rivers? One of the best ways to get on fish fast is offering the fish multiple choices. That means, using your partner to help eliminate bait options. 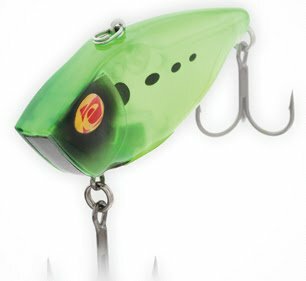 Try not to use the same bait as others in your boat, and if you do settle on the same make and model lure, play with different lure colors until a clear winner emerges. Chigger Crawin green pumpkin and our casts were landing just five feet apart. But, when I looked closer at what he was doing, I noticed he was fishing a fluorocarbon main line, a ¾-ounce sinker and clacker bead on an 18-inch fluoro leader. My line choice was braid, my sinker was slightly lighter at a ½-ounce, my leader was only 12 inches, and I purposely rigged without a bead. Speed is another factor to consider, especially now that companies like Abu Garcia are offering models that cover the speed spectrum. Surprisingly, fast is often better than slow. Recently, we fished a 160-acre natural lake known for producing trophy fish. Yet, two hours into the day we had yet to boat a decent bass throwing swim jigs, pitching to holes in the dense weeds or drop-shotting. Out of desperation, I started burning a jig over shallow grass, a technique that has produced well in the past. Within minutes a solid 4 pounder slammed the jig, and in the next 10 minutes three more quality fish joined him. Here’s the “take home” message: Most baits are a lot more versatile than most anglers realize. That’s the deal. Lake Commandos has taught me to fish creatively with attention to the details, making subtle, on-the-fly adjustments, when necessary to provoke strikes. Just weeks ago I was on another Texas reservoir fishing with Tony Owens, biologist/tournament angler with the Texas Freshwater Fishery Center in Athens. Tony chose rattlebaits as his pattern, so I picked jerkbaits. The water temperature was trending upward all week, jumping from 50 to 60 degrees in a matter of days. All indications pointed to bass starting to move up toward spawning habitat. So we targeted shallow areas with the warmest water we could find in the system. We gave ourselves the choice between two different rattlebaits for the episode: the Sebile Vibe Machine and the slightly bigger and heavier Sebile Lipless Seeker. My opponent was running the boat and throwing the Vibe Machine into shallower water. I was probing slightly deeper with the Seeker. We fished an entire hour or more without a bite. Then we moved up even shallower into a back bay, where I never in a million years would have considered fishing a rattlebait. It was only two feet deep with intermittent grass! A traditional rattlebait would have been hard to fish, but the Vibe Machine runs shallow and when fished on a slightly faster 7.1:1 reel on heavier line, we were able to keep our baits grass-free and in the strike zone. The result? We smoked the bass! Again, it seemed counter-intuitive, but it worked! This particular outing also illustrated just how important color can be once the pattern is set. My guest fished natural shad color and I picked chartreuse. We fished the same baits on the same gear in the same areas and chartreuse flat-out caught more fish than natural shad. Of course, once he switched, it was game on! Left to fish intuitively, I would’ve thrown a spinnerbait, jig, or a Texas-rigged worm, but never a rattlebait. But by being forced to do something different, I learned an entirely new way to catch bass. Here’s one last example. This past summer we were stormed off our objective lake and onto a smaller, 500-acre lake picked at random. My opponent chose a medium-diving crankbait and I went with a shallow diver. It wasn’t long before I was up 10 or 12 fish to his zero. Again, it came down to details. I was fishing a shallow-diving bait on a 7.9:1 retrieve ratio reel, which simply put the bait in front of more fish faster than his medium-diving bait on a slower retrieve. It’s a good example of identifying what to do when the fish are “on,” in terms of tweaking speed or bait selection. There are countless more examples from filming that I could use to convince you to fishoutside the box. But I won’t belabor the point. For more examples, kick back and watch and episode or two of Lake Commandos. I challenge you to Go Lake Commando. Grab a buddy, head to water you haven’t fished before (or recently), pick a couple patterns, and stick with one for the first part of the day. Then switch. See who catches the most fish. More importantly, figure out why they were more successful. After all, in a sport rich with bait, tackle and gear choices, the best choice is not always what you might think. The fish will let you know when you’ve picked a winner, that I can guarantee.